Painless, reliable DVI extension over fiber -- with built-in DVI-to-fiber signal converters and EDID storage, all in a tiny form factor! The DVI-FM500 Extender lets you extend your DVI source up to 5,000 feet away using a 100% fiber optic extension solution. 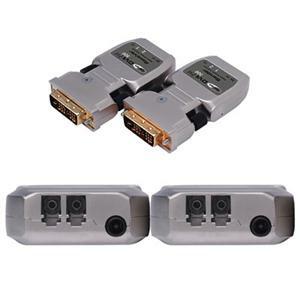 Attractive and compact DVI-to-fiber modules connect to each other via just two LC fiber optic cable strands. Extender units fit neatly behind equipment for a clean installation. The on the fly EDID programming feature enables quick and correct synchronization of the video resolution to the display without any manual configuration. It's a great way to extend DVI easily and cleanly.